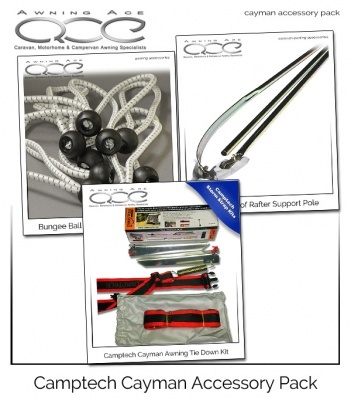 This accessory set comprising genuine Camptech products is compatible with all Camptech Cayman Full Traditional awnings. These Storm Straps allow for more secure pitching of your Camptech Cayman awning during inclement weather conditions, attaching to the buckles already sewn onto your Camptech awning. 10x Elastic Bungee Cord Ball Loop with 5mm bungee cord. Ball & Loop Bungee Cords are ideal for securing tarpaulins, trailer covers, flysheets and for attaching windbreaks and mud walls to the ground or other camping equipment. Handy for storage and stowing equipment and extremely popular with caravan enthusiasts, boat owners and campers around the world. Provides additional support for your awnings roof during inclement weather conditions, these poles are shaped to the contours of your roof providing excellent rainwater runoff and to prevent water pooling.